An experienced group of technical advisors is available to assist with questions regarding custom HuCAL monoclonal antibodies and their use in a wide range of applications. 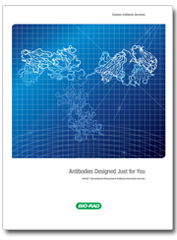 Publications citing the use of HuCAL antibodies by our customers, and also relating to the development of the HuCAL technology. Information about monovalent and bivalent Fab formats and conversion to full immunoglobulin format with a choice of isotypes. Notes: Axxx, Alexa Fluor; B., Biotin; C, immunohistology frozen sections; E, ELISA; FC, flow cytometry; IF, immunofluorescence; IP, immunoprecipitation; P, immunohistology paraffin sections, WB, western blot; anti-c-myc antibodies are not recommended for use in P.